Provide comfort for the family of Elizabeth Armour Couch with a meaningful gesture of sympathy. 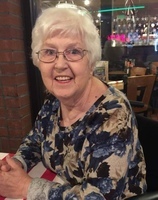 Elizabeth Armour Wade Couch, age 90 of Alto, passed away on Thursday, January 31, 2019. Born in Lincoln County, Georgia on October 17, 1928 to the late Jack and Pauline Pittman Armour. Mrs. Couch retired from Carwood Manufacturing with 30 years of service. She enjoyed gardening, sewing and spending time with her family. Mrs. Couch attended Glory Bound Baptist Church and was the best biscuit maker in Habersham County. She will be deeply missed by everyone. In addition to her parents, she was preceded in death by her first husband, Otha Wade; son, Harold L. Wade; daughter, Linda Warwick; son-in-law, Mark Grier; sisters, Louise Oliver and Susie Stancil. Surviving are her husband of 30 years, Fred P. Couch of Alto; daughter and son-in-law, Christine Grier Wilkes & Rev. Donnie Wilkes of Clermont; son-in-law, Randy Warwick of Demorest; daughter-in-law, Trudy Wade of Alto; 7 grandchildren; 15 great-grandchildren; 3 great-great grandchildren; brothers, J.B. Armour, James Armour and L.D. Armour all of Alto; twin sisters, Alma Wiley of Lula and Thelma Brock of Alto; special sister from another mother, Gertrude Grier of Lula; several nieces, nephews, other family and friends. Funeral services are scheduled for 2 pm, Saturday, February 2, 2019 in the Chapel of McGahee-Griffin and Stewart with Rev. Donnie Wilkes officiating. Interment will follow in Yonah Congregational Holiness Church Cemetery with Rev. Michael Wilkes officiating. The family will receive friends from 4-8 pm on Friday at the funeral home. To send flowers in memory of Elizabeth Armour Wade Couch, please visit our Heartfelt Sympathies Store. Consider providing a gift of comfort for the family of Elizabeth Armour Couch by sending flowers. We encourage you to share your most beloved memories of Elizabeth Armour here, so that the family and other loved ones can always see it. You can upload cherished photographs, or share your favorite stories, and can even comment on those shared by others. Provide comfort for the family of Elizabeth Armour Wade Couch by sending flowers. She taught me so much about cooking and canning and the love of the Lord. She never saw you with telling you she loved you. She will be missed. I pray for you at this time of loss.